Flexo printing machine is used for printing roll paper,roll coated paper and plastic film etc material. It is idea equipment for printing the label. 1, Adopt the ceramic anilox cylinder to transfer the ink. 2, Unwinding and rewinding tension are auto-controlled by tension controller. 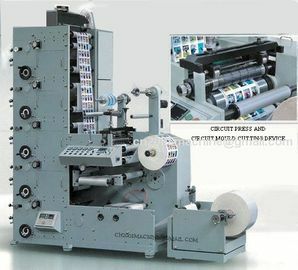 3, Each printing unit adopts 3600 plate-adjustment. 5, This machine has one die-cutting station, and it can make printing and die cutting finished in one process. 6, The ink rollers will be separated from the printing roller, keep running when machine stopped. 7,The machine can finish material-feeding, printing, varnishing, drying, laminating, die-cutting and rewinding in a lump. It is an ideal machine for printing note and top-grade adhesive label.